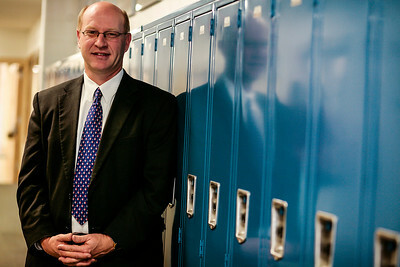 Lathan Goumas - lgoumas@shawmedia.com Fox River Grove School District #3 superintendent Dr. Tim Mahaffy poses for a portrait at Fox River Grove Middle School on Tuesday, Nov. 19, 2013. Mahaffy teaches a special Veterans Day program to fifth grade students which includes the story of McHenry County's only Congressional Medal of Honor recipient Elmer Bigelow. Lathan Goumas - lgoumas@shawmedia.com Fox River Grove School District #3 superintendent Dr. Tim Mahaffy poses for a portrait with fifth grade students at Fox River Grove Middle School on Tuesday, Nov. 19, 2013. Mahaffy teaches a special Veterans Day program to fifth grade students which includes the story of McHenry County's only Congressional Medal of Honor recipient Elmer Bigelow. 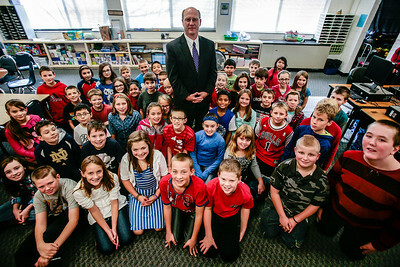 Fox River Grove School District #3 superintendent Dr. Tim Mahaffy poses for a portrait with fifth grade students at Fox River Grove Middle School on Tuesday, Nov. 19, 2013. Mahaffy teaches a special Veterans Day program to fifth grade students which includes the story of McHenry County's only Congressional Medal of Honor recipient Elmer Bigelow.